So this week brought us the upsetting news that NBC have decided not to renew Hannibal for a fourth season, meaning this latest run of episodes will see the show to its conclusion. It's a horrible decision to swallow, Hannibal is, after all, one of the most artistically defined and intellectually impressive shows currently on air. But its string of low ratings can't be ignored; NBC are a major network in the U.S and therefore can't keep a show on the air if it struggles to draw even 1m viewers. After eventually coming to terms with the fact that Hannibal would end this year, I sat down to watch this third episode of this...gulp...final season. And with its beautiful writing, powerful imagery and sheer narrative unpredictability, that fact came back twice as hard. Secondo is almost a polar opposite to the previous episode, Primavera, in that it focuses heavily on thematic ideas and writing rather than the visuals. Whilst I didn't find any issues with Primavera's visual focus, Secondo does feel immediately like a more accomplished episode in that it spends a lot of time fleshing out the story despite not actually taking us anywhere. Episode one dealt with the catch up of Hannibal and Bedelia, episode two relied on Will, and episode three brought Jack Crawford back into the running, albeit in a slightly different way to the former two. Season three has been slow thus far, so Secondo rightfully didn't allocate this episode's entire run time to Jack, rather we saw his goings on interspersed with with scenes of Hannibal and scenes of Will. If the first two episodes, as good as they were, felt like catch up, Secondo finally felt like momentum. What resonated with me most after the episode finished were the parallels it drew between Hannibal and Will. Despite their geographical distance, the two are almost closer now than they've ever been. 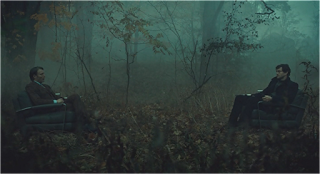 Hannibal's stabbing of Sogliato was a heart stopping moment, ultimately resulting in Bedelia removing the weapon from his head, which, as Hannibal points out to her, means she technically killed him. If we look back at episode one, it's clear that this moment is destined to correlate to Hannibal's questioning of Bedelia as to whether she is merely observing or actively participating, and we now know the answer. But this moment works doubly well thanks to its similarity with an almost identical moment in Will's part of the episode. Investigating Hannibal's home, Will comes across Chiyo, who is holding the man she believes to be responsible for Hannibal's sister's murder hostage. Following a discussion as to whether Chiyo would or could kill someone, Will sets the bearded man free, and Chiyo murders him. It's a powerful comparison between Will and Hannibal that confirms something that can be read in a multitude of ways; Will and Hannibal are more alike now than ever. Secondo handles Hannibal's backstory well; he is, after all, one of those villains that works better the less we know about where they came from. When I learnt Will was heading to Hannibal's home in his origin country of Lithuania, I was worried that we would begin to understand Hannibal; I don't want to understand Hannibal, at least not through anyone else. If I understand him, it needs to come from his mouth only. But Secondo handled this expertly, giving us information about the location but not the person, whilst still strengthening him as a character through contrasts with his own story in this episode. Whilst it was Will at Hannibal's home, it was Hannibal's story that gave us all the necessary framework and narrative understanding. Jack's scenes might not have amounted to much, but when this show is viewed from afar Jack becomes a very minor character. Hannibal is, essentially, about two people, and those two people shone in episode three. The story may not be in full swing yet, but the framework has been set and the paths have been laid now. The only way to go is up. Or down. Or even left. With a show this unpredictable it's hard to know, really. The snail motif returned again tonight, and I'm not entirely sure I get what Fuller is aiming for here. I can only correlate it to the slow nature of this season so far. Whilst I call this season slow, that should in no way be read negatively. I've adored all three episodes. The visuals may have taken a back seat here, but it was still a gorgeous episode. Hannibal's home setting found the perfect balance between horror and gothic beauty. "You have a very good butcher", "I do indeed". Wonderful. "That might have been impulsive", "I've been mulling that impulse since you decided to serve Punch Romaine". I almost forgot how funny Hannibal can be. God, I'm going to miss this show.